A writer and citizen scientist, I currently live in Northfield, Minnesota. Three recent books are Following the Earth Around: Journal of a Naturalist's Year, Brevities, and Rice County Odonata Journal: Volume Four. Saturday, July 11, the Anderson Center in Red Wing will host its 16th annual “Summer Celebration of the Arts” from 11:00 a.m.-5:00 p.m. This is one of the premier arts festivals in the state and showcases the work of more than 100 local and regional artists, craftspeople, writers, and musicians. Work featured includes paintings, pottery, furniture, weavings, jewelry, wood carvings, photographs, textiles, stained glass, and much, much more. As part of this celebration, Red Dragonfly Press will be hosting poetry readings by three, prize-winning poets. Admission to the Anderson Center celebration is $3.00 for adults, $1.00 for students, free to Anderson Center members. The poems in Modern Love & Other Myths explore, as Elizabeth Bishop phrased it, “efforts of affection” in our contemporary world. Sutphen’s appraisals—both personal and general—resonate deeply with all who have mapped the story land between “hello” and “goodbye.” The title invites us to examine what we mean by myth, and whether, in fact, love can ever be regarded as modern. Wise and inquisitive, the poems in this collection travel across continents as easily as into the heart. 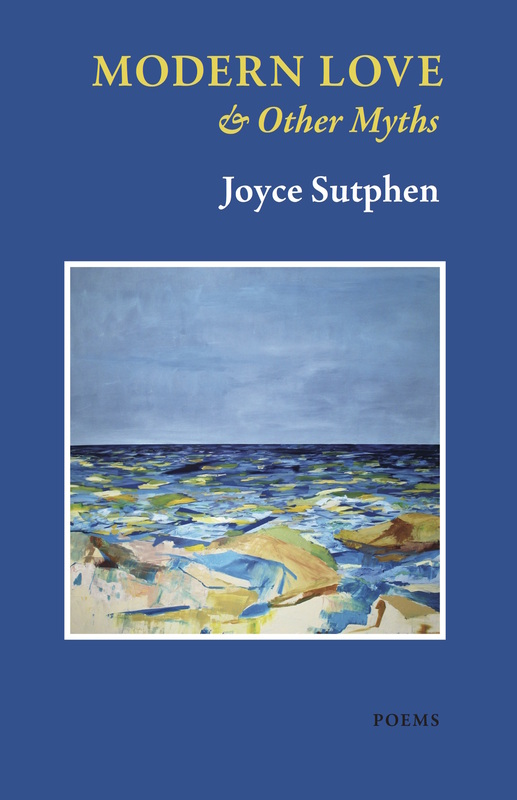 Joyce Sutphen, current Minnesota Poet Laureate, lives in Minnesota and teaches at Gustavus Adolphus College. Diane Jarvenpa has long been a favorite poet of mine, ever since reading her first book, Divining the Landscape. Like many of us she leads several lives: poet, parent, Finnish folk singer. Ok, that last role is, admittedly, rather unique and remarkable and something she does under the stage name, Diane Jarvi. Ten years ago, in 2005, I printed her chapbook Ancient Wonders: The Modern World. 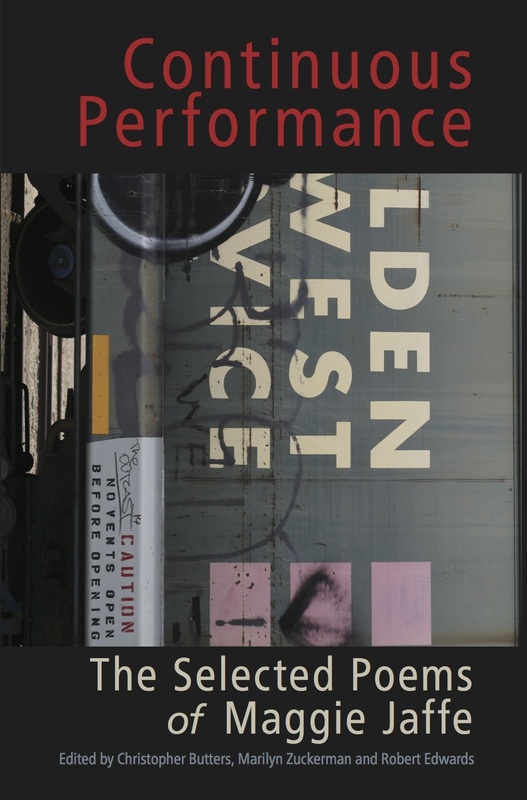 This modest chap, six poems and six matching illustrations by Sheralyn Barnes, sold out faster than any chapbook the press has published, with the possible exception of Superman: The Chapbook by Dorianne Laux. Because copies are no longer available, I thought I’d try scanning the pages and constructing a digital facsimile as small compensation for the vast majority unfortunate enough to miss the original print version. About a year ago, Diane recorded Ancient Wonders and allowed me to make an experimental digital version. The result of that experiment is an ebook with embedded audio and is available only for iBooks. 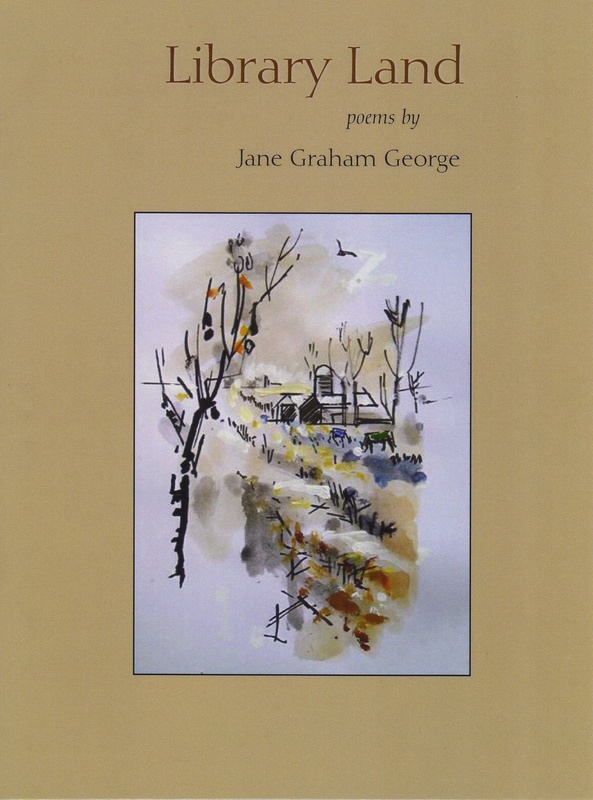 And if you’d like to own a print version of the poem sequence, it’s included in her full length collection, The Tender, Wild Things (New River Press, 2007). Highly recommended. The poet Thomas R. Smith visited this morning to go over some proof pages and to answer some questions I had about design possibilities for his forthcoming collection, The Glory. While we worked inside, winter held sway outside. 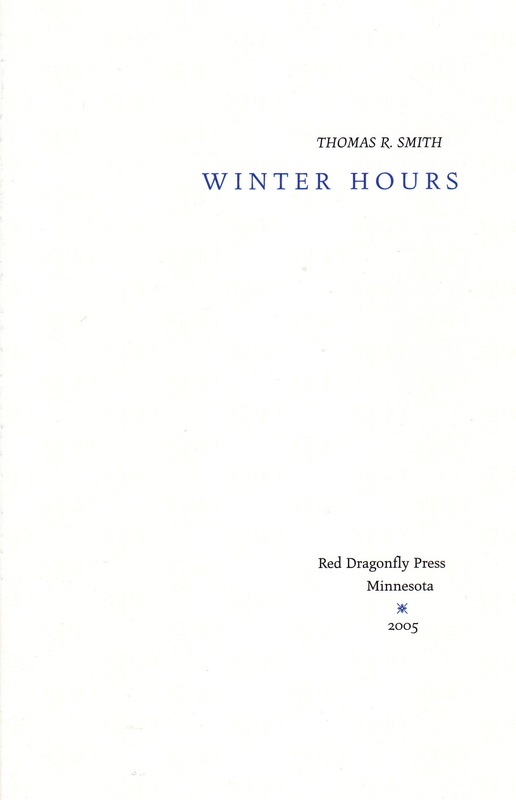 The weather and the visit put me in mind of an earlier collection of poems by Smith, one published ten years ago, Winter Hours. Of Smith’s numerous books, this might be the most overlooked. a drone of lawnmowers, from the future…. With Valentine’s Day just ahead, it seems a good moment to revisit a chapbook filled to the brim with desire, overflowing with thoughts about longing, love, and eros. 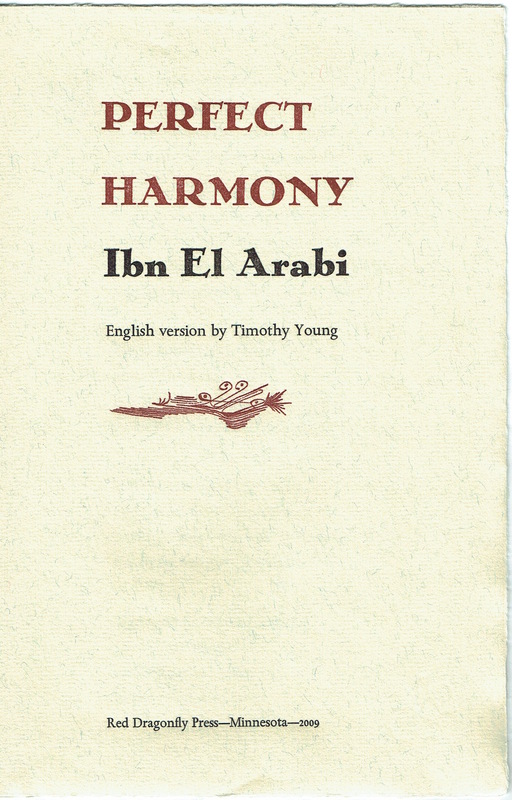 The chapbook is Perfect Harmony and it contains a poem written eight centuries ago by Ibn El Arabi, an Andalusian Sufi mystic and poet. 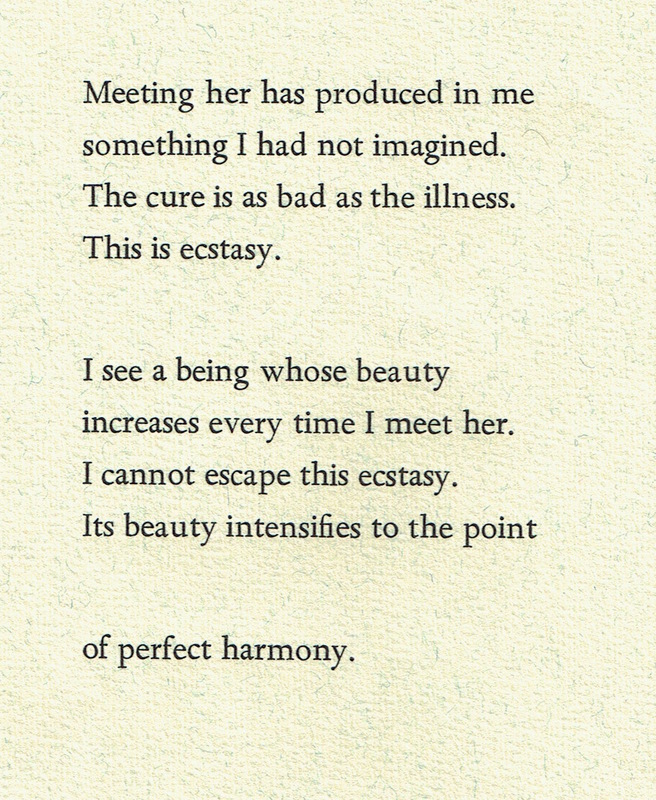 Over the course of this poem, love at first sight is elevated to the level of philosophy and religion, ecstasy intensified “to the point of perfect harmony.” That this poem remains immediate and passionate all these centuries later and in another language has much to do with labors of Timothy Young; always good to have a poet translate a poet. 100 copies were printed in 2009 with the assistance in the print shop by the translator. The Spectrum type was set by hand, letter by letter, then inked and impressed upon pages of Ingres paper. Autonomous drawings by Dalyce Elliott accompany the text. These pages are sewn into Khadi wraps. The paper and type alone are a kind of Valentine. In addition to the chapbook version, this poem is included in Timothy Young’s most recent book, To the Palace of Kings: Selected Longer Poems (Red Dragonfly Press, 2014) and is available on a CD, Perfect Harmony. The latter, an union of spoken word and brilliant musical accompaniment, comes highly recommended, is only available direct from the translator: mail $10 per CD plus $3 shipping to Timothy Young, 1610 Fernwood St., St. Paul, MN 55108. Maggie Jaffe (1948 – 2011) was author of six books of poetry. Both 7th Circle and The Prisons, won the San Diego Book Award for Poetry. She taught at San Diego State University in the English and Comparative Literature Department. She was also the recipient of a National Endowment for the Arts Grant, and a California Arts Council Grant.